After a long and largely sleepless nine hour flight to Schiphol, we jumped right into serious touring. 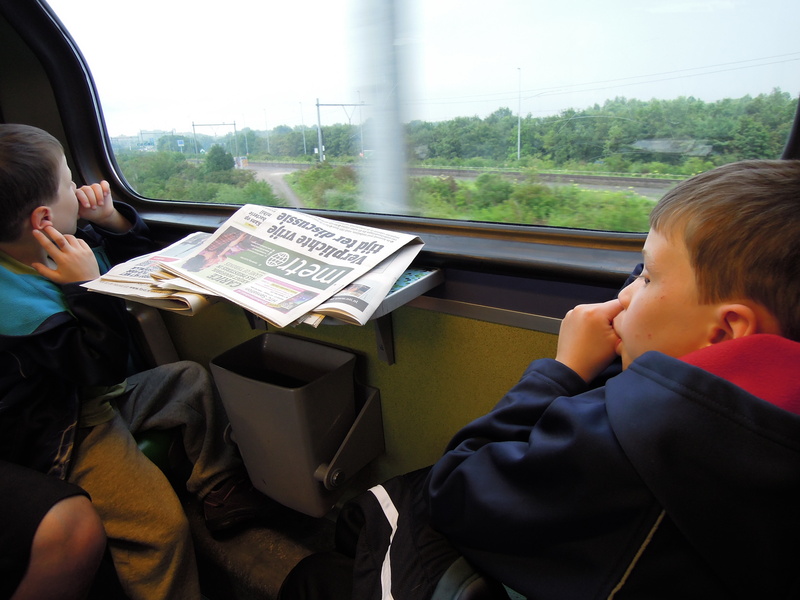 Stephen and I stowed our luggage away in a couple of airport lockers, ordered up a handful of train tickets and jumped aboard a train to Alkmaar. Alkmaar is a cheese town. We went there in anticipation of witnessing the weekly cheese market that is certainly the largest and oldest of its kind in the Netherlands. Unfortunately, we had our days mixed up. No cheese market, but lots of opportunity to walk around a very pedestrian-friendly and scenic town. The boys were real troupers. I do not know very many little boys who willing walk the distances our boys do, especially when they had-at most-a little over an hour of sleep in the last 24. 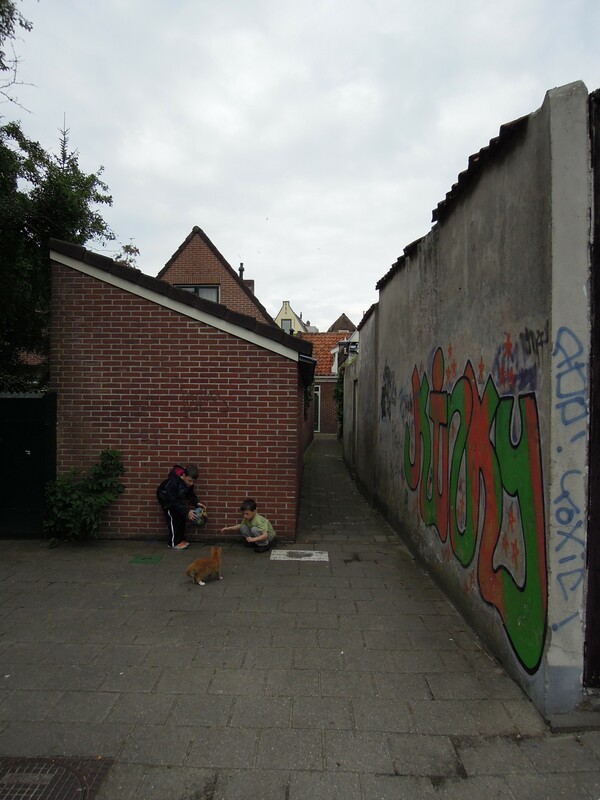 However, we took our time and found little nooks were they could play freely. They were very happy to make friends with a bold little kitten in an old church yard (see photo above). They found a rubber ball in the yard that the kitten enjoyed stalking, much to their amusement. Even though there was no cheese market, we still found a nice cheese store and purchased some really delicious sheep milk cheese that we enjoyed later on with a bottle of red wine. 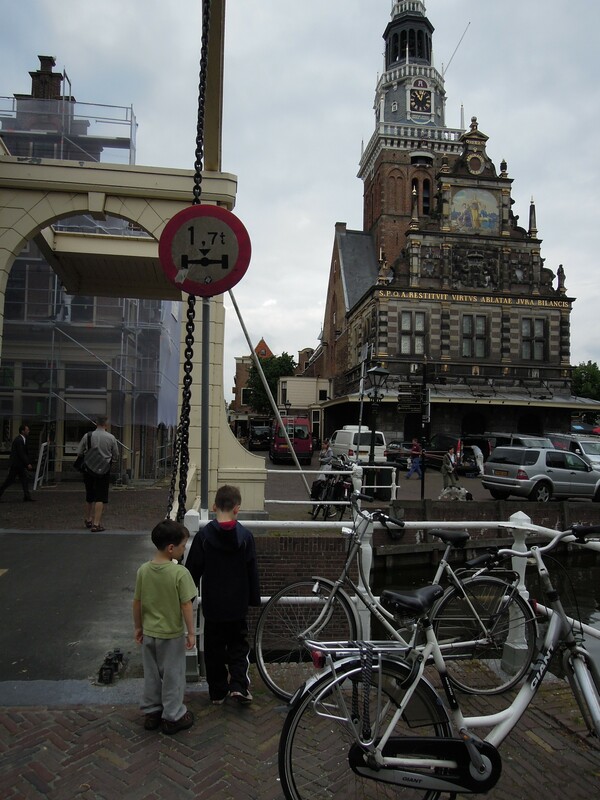 Plus Alkmaar was an amazingly pretty little town. There were so many nice bike and walking paths winding through green parks and quaint neighbourhoods along the river. I’ve never had the desire to live in the Netherlands, but it is hard to resist imagining what it would be like to live in a place like Alkmaar. After five hours, we were starting to run out of steam, so it was back to Schiphol to collect our luggage. The toughest part of the trip was resisting the temptation to sleep on the smooth and gently rocking train to Den Haag. Okay…plus when we got there, we needed to tackle the 45 minute walk with our luggage AND two desperately tired children to Dave and Jelena’s house…but we did it! The kids made it to 8:00 pm with no melt downs and a good dinner of lamb stew in their bellies. We didn’t hear from them until 8:30 this morning! In all, I’m feeling pretty optimistic that we are going to have a great trip. Sooo good to hear from you! Glad you’ve got off to a great start!!! Dad was on the phone to North Is. College and has an appt. with a counsellor on Tuesday, not bad eh. We are off to the farm to weed the strawberries and coffee, of course. I’ll give Grandma your blog address… Look forward to more news. Glad you enjoyed Alkmaar, you’ve got to go back to the cheese bidding, though. The kids would really enjoy it. Have you been to the city with the old clocks and instruments??? Can’t remember the name of the city, Appledoorn? Take good care of the kids and enjoy yourself.